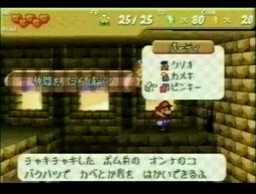 A list of characters on the select screen. Obviously within Dry Dry Ruins. 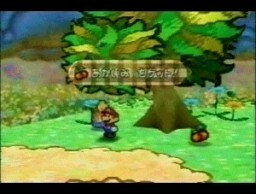 The battle menu design is more alike it is today, though still with the hearts rather than the fraction. 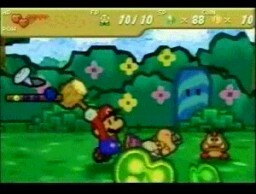 This shot is most likely from the point where the Koopa Bros speak with Bowser. The only real difference is that Bowser's cheeks have an odd shading effect. The menu is very similar to the final version of the menu. 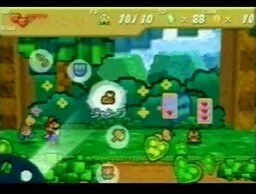 Though, you'll notice Mario is level 0. An early battle scene. The background is very underdevelouped. 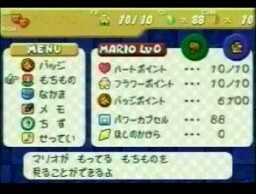 And, also, the original style of battle stats is used here. 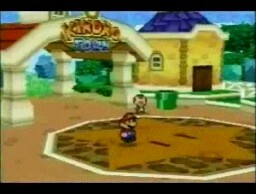 Toad Town was, at one point, named like it was in Super Mario RPG...The Mushroom Kingdom. A collage of six different pictures. 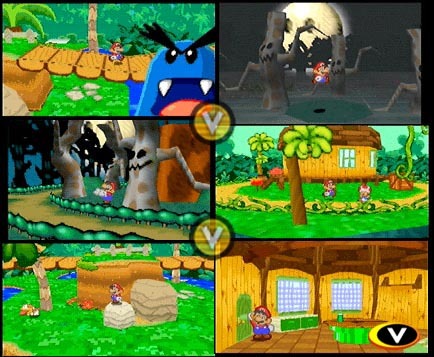 Many of them are very interesting, ranging from enemies that never appeared to scenes and places that were never in the game. 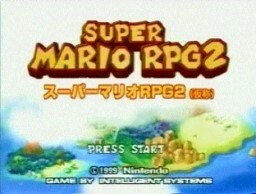 A title screen that, obviously, was from the time when the original name of Super Mario RPG 2 was to be used. The world map behind the clouds is very similar to the end game's world map. The name on the sign seems to have been changed to Kinopo Town, if my eyes aren't deciving me. Kinopio is Toad's Japaense name.